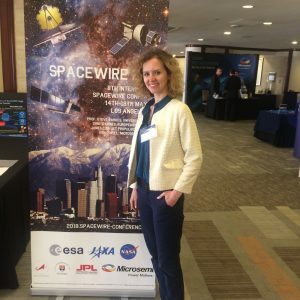 The 8th International SpaceWire Conference took place in Los Angeles, USA, from 14 May 2018 till 18 May 2018. 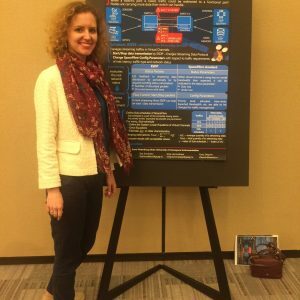 Irina Lavrovskaya, a researcher of IHPCNT (Embedded Computing for Mobile Communications Lab), participated in this conference. 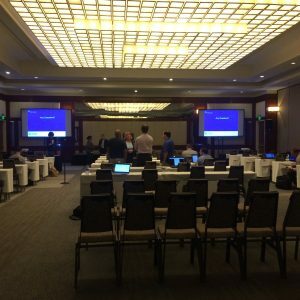 In the section Networks & Protocols she presented a paper “Real time video data transmission in spacefibre networks with the ESDP transport protocol” which discusses jitter impact in dependence on the quality of service used in SpaceFibre Data Link Layer. In the Test & Verification session Irina Lavrovskaya made a presentation “Computer-aided design system for onboard SpaceWire networks” which presents a new software tool for design and simulation of SpaceWire networks. Moreover, we participated in a poster session with the paper “Approach to increase SpaceFibre link bandwidth usage for streaming data transfer” which deals with the mechanisms for the increasing of network link bandwidth usage in SpaceFibre networks.